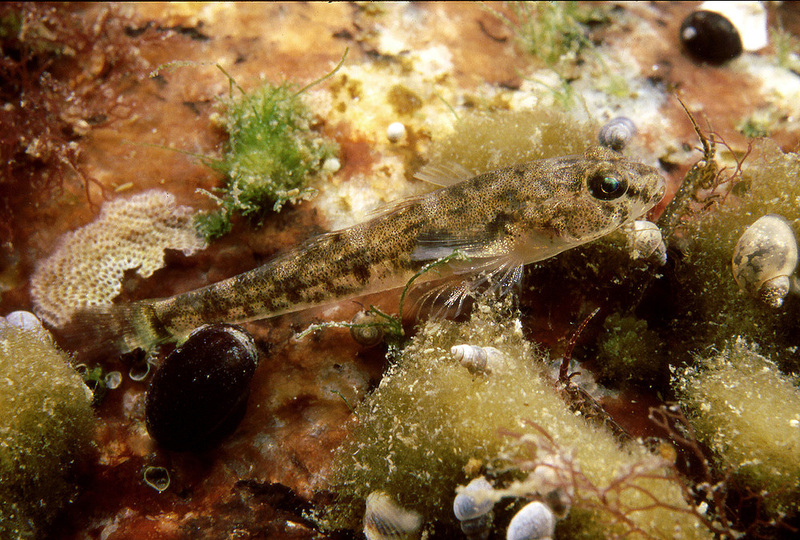 There are around two thousand species of gobies in the world. 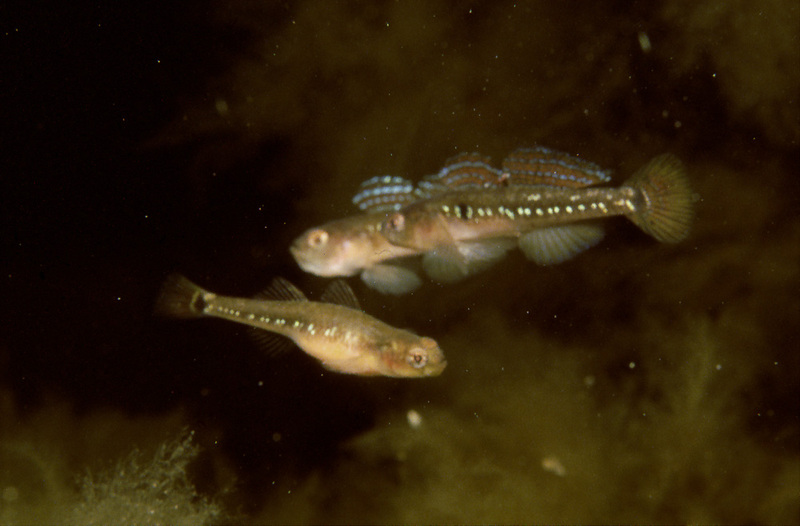 Luckily, or unluckily depending on one’s view, there are only four in the northern Baltic proper; or used to be, because since the turn of the century the fifth, the round goby, has already been observed in the Finnish waters. For the purpose of this book we’ll just forget about the newcomer, though. 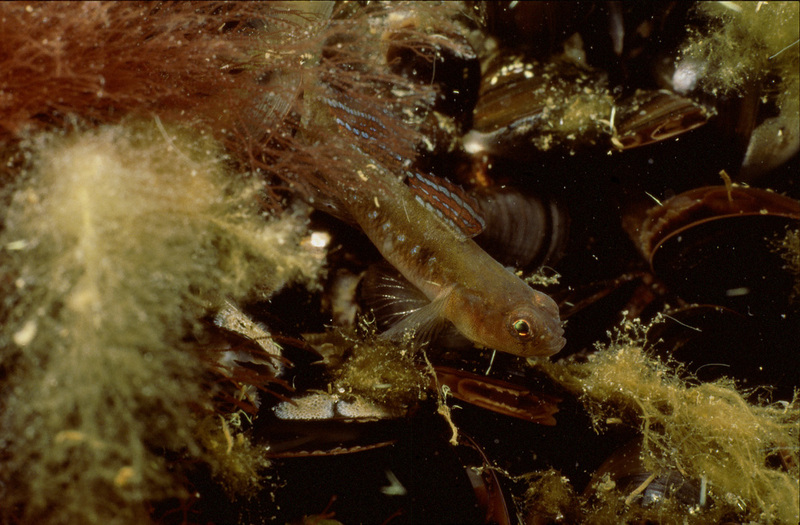 The gobies are primarily bottom dwelling fishes with the pelvic fins having grown together to accommodate this kind of life. 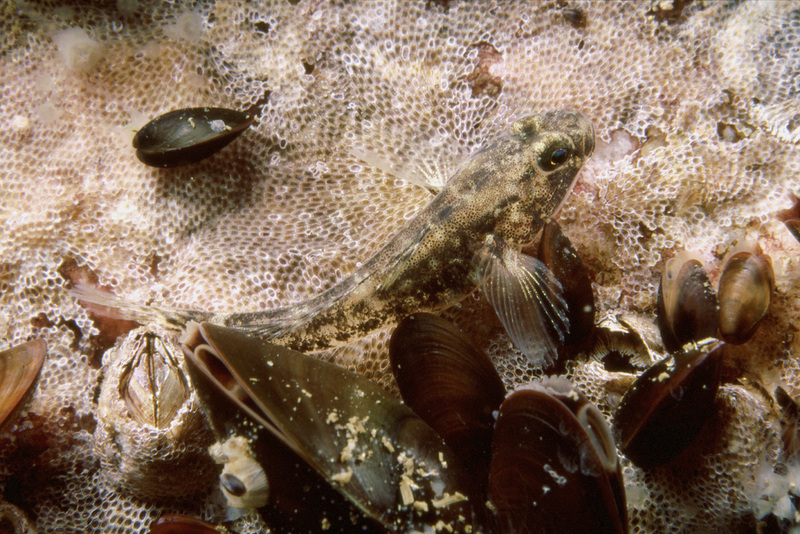 Of the four species here it’s only the two-spotted goby that lives its adult life more or less free-swimming but even this species does spend some time lying on vegetation or the bottom. 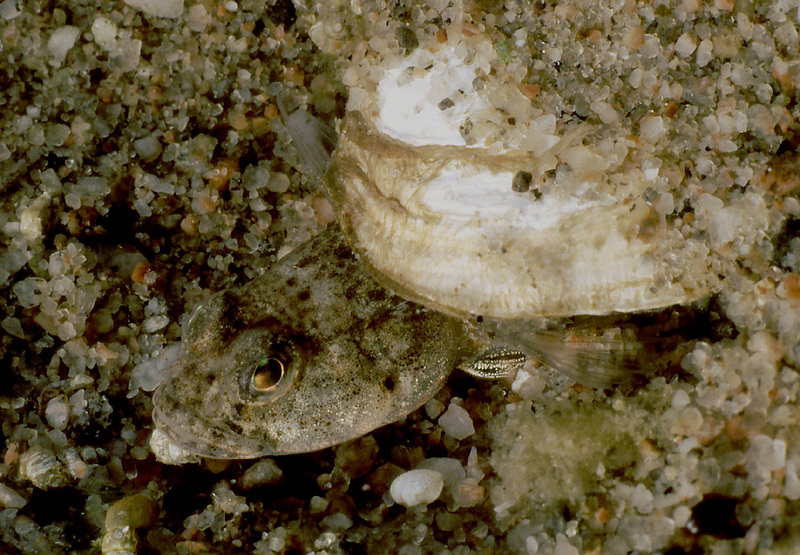 The two species living on soft bottoms, common and sand goby, are very hard to differentiate between each other. 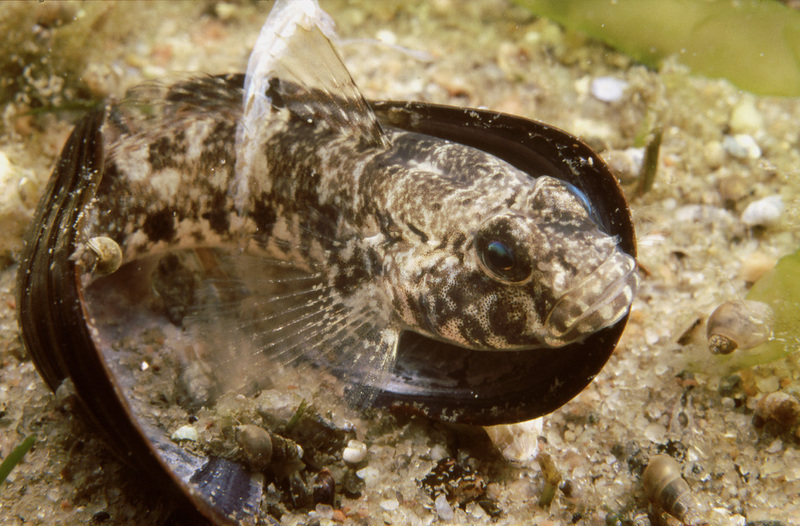 For someone intimate with the gobies it could well be that it’s their behavior that often gives them away. 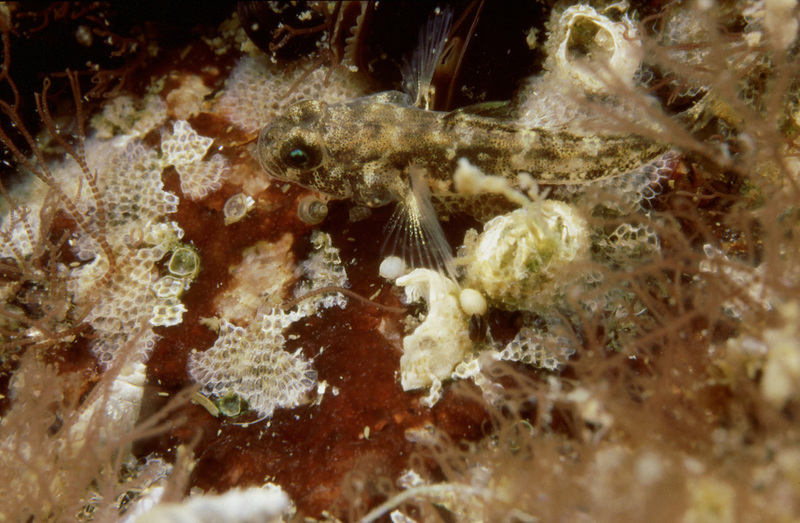 That is at least the way I think of it: to me, it’s the common goby that, most of the time, lets itself be photographed more easily. 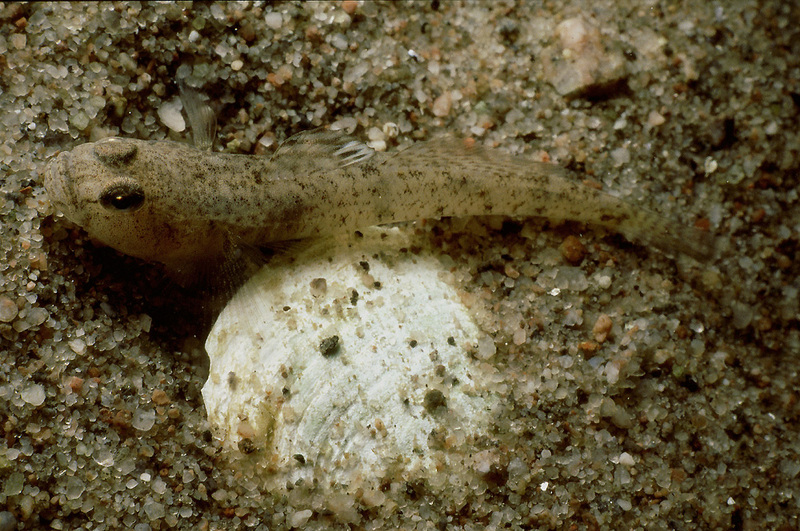 The sand goby is more reluctant, but at least the male can usually be tamed when he is guarding his eggs. 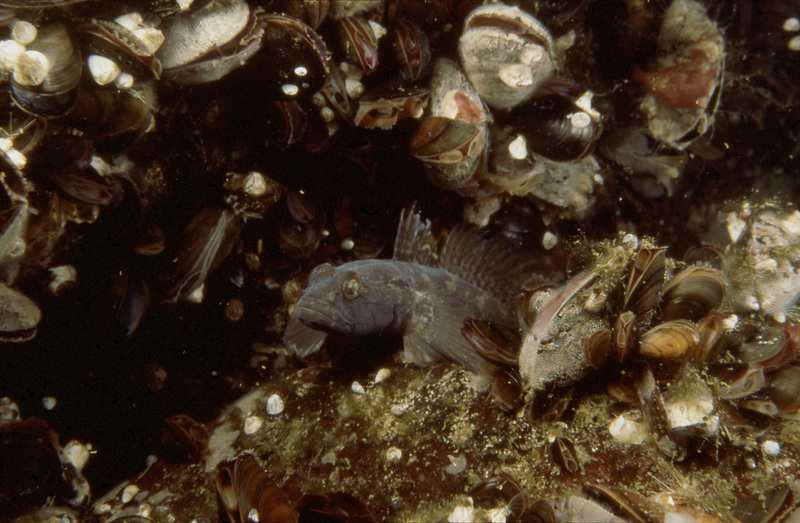 The two-spotted, in general, is the most nonchalant of the four, and the black goby, although not shy as a juvenile, has the distinct behavior of making a short spurt to a hiding place in a crevice or under a stone; often just when the photographer is about to get to the right firing distance. 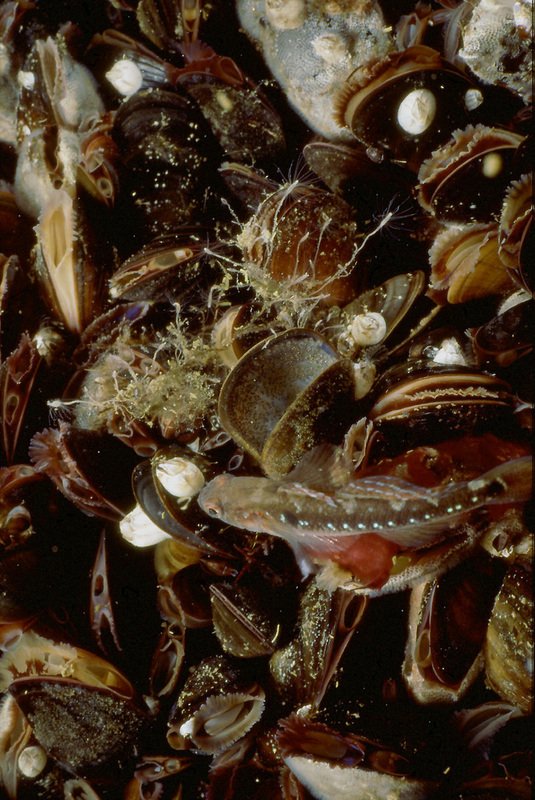 With just four species being around, though, both of these two species have enough of their own unique characteristics to be identified even without the behavioral ones. 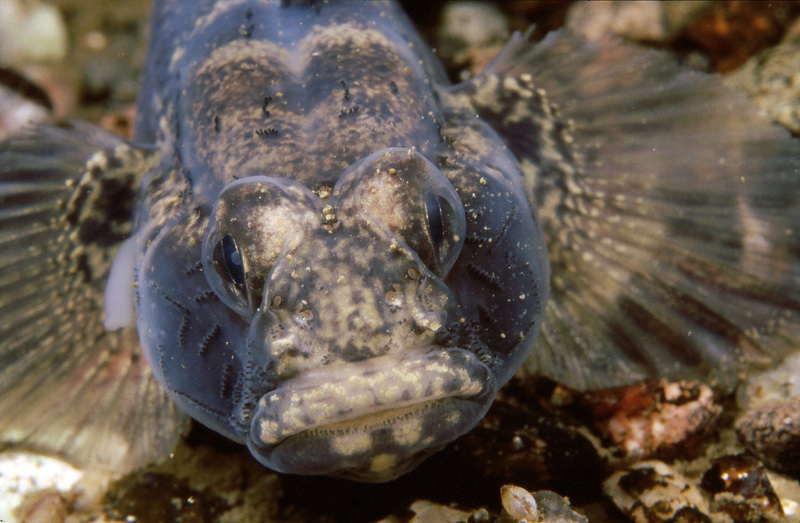 The gobies are found everywhere in the coastal zones and are fun to be with, each species having its peculiarities. 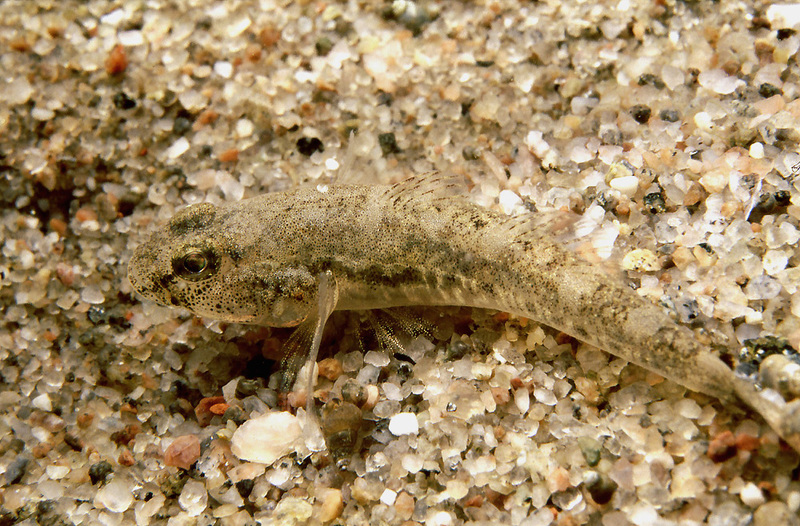 The sand goby has very effective survival strategies and the black goby, living to an age of several years unlike the other local species, is also abundant. 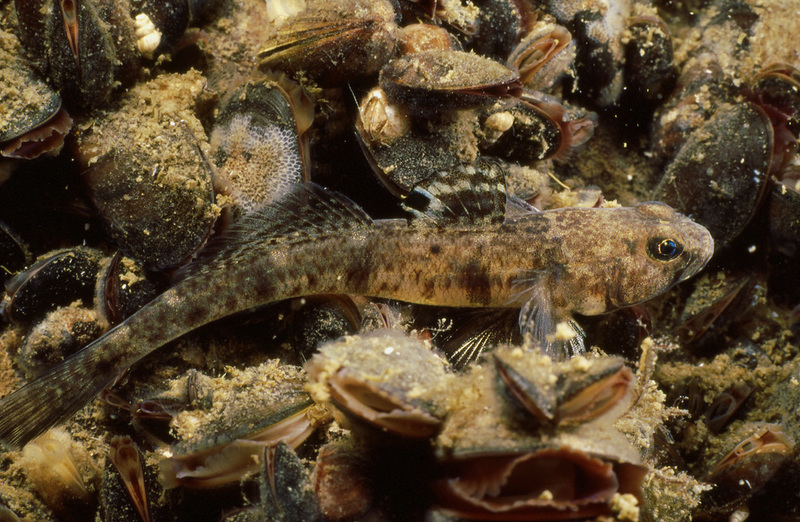 The common goby frequents the shallowest parts of the shores and is more fearless in its behavior towards a diver than a sand goby, which it otherwise very much resembles. 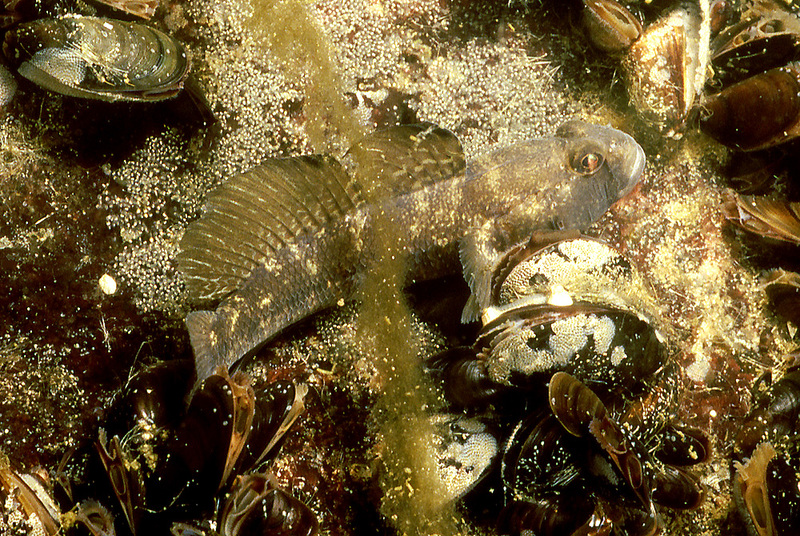 Identification from the colors and markings is difficult but the common goby is usually also rounder in the head area. 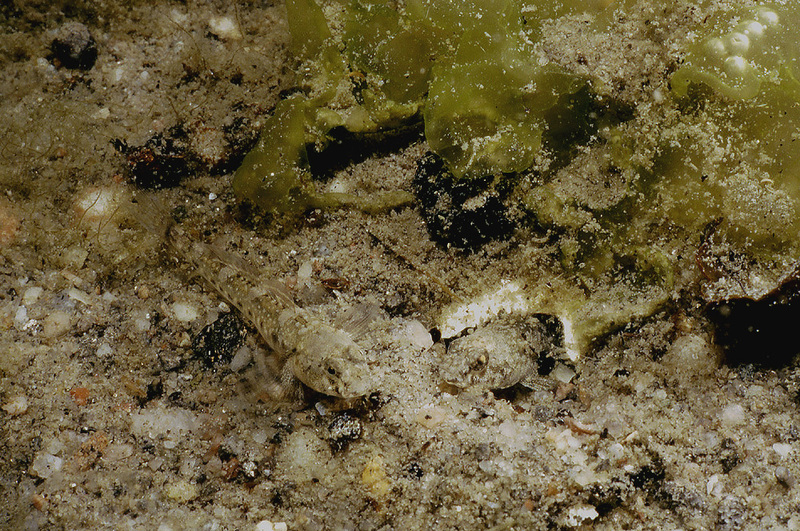 When either one of these two is lying on sand its identification is less certain and, in any case, only by using some kind of magnification and checking the decisive characteristics it’s possible to be absolutely certain of the species. 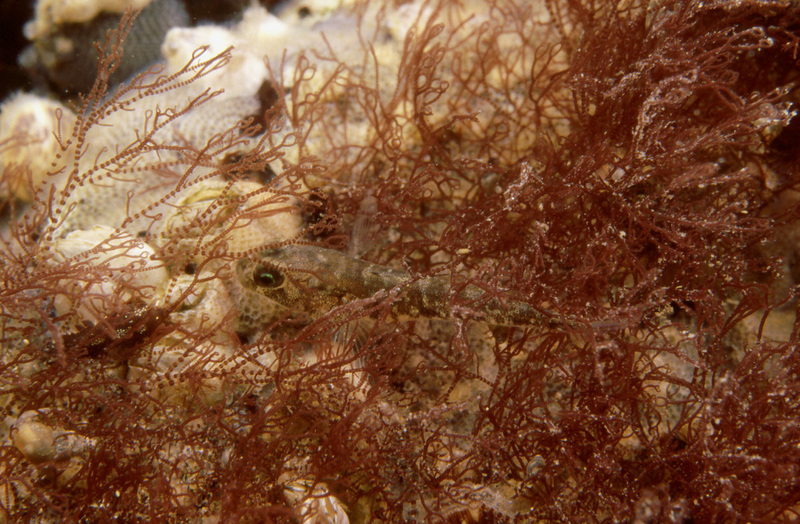 The nest building behaviors of common and sand gobies are similar: the male turns a shell half, preferably of a sand gaper, to form the roof and digs an open space underneath. 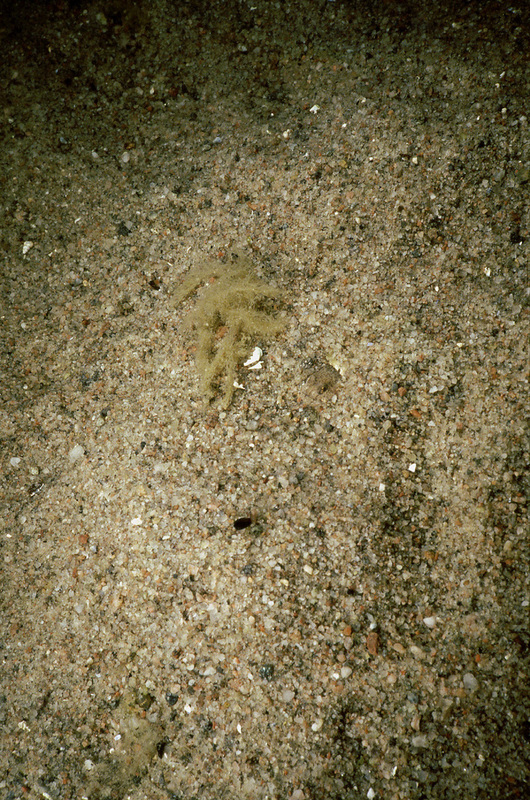 Most of the area the first of these photos covers has been piled up of sand by the male, so the construction work of it can be impressive. 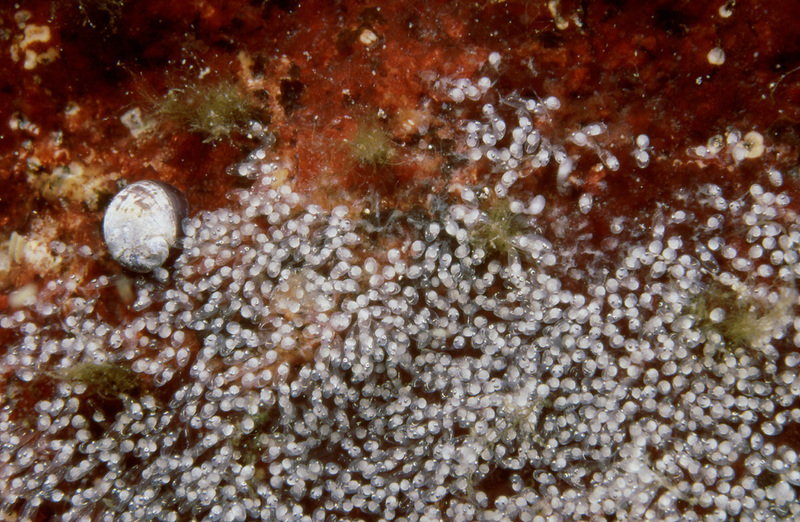 The eggs, then, must be laid and fertilized upside down. 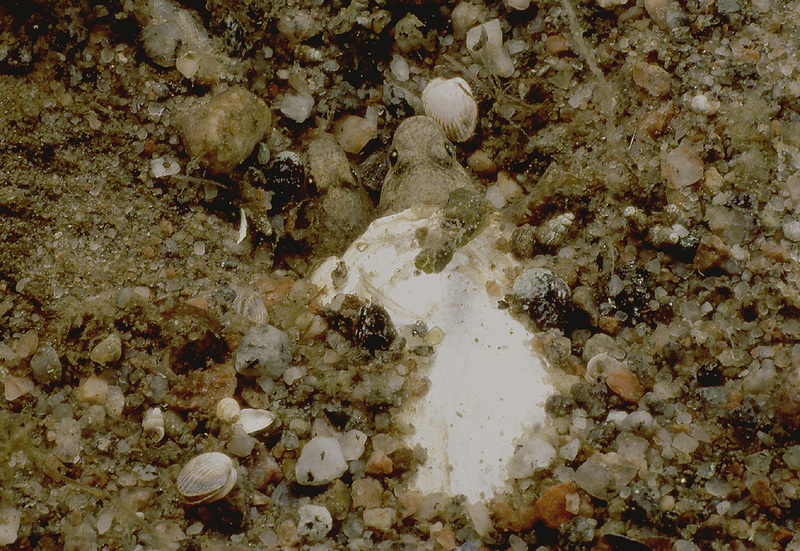 The male remains at the nest to aerate and guard the eggs. 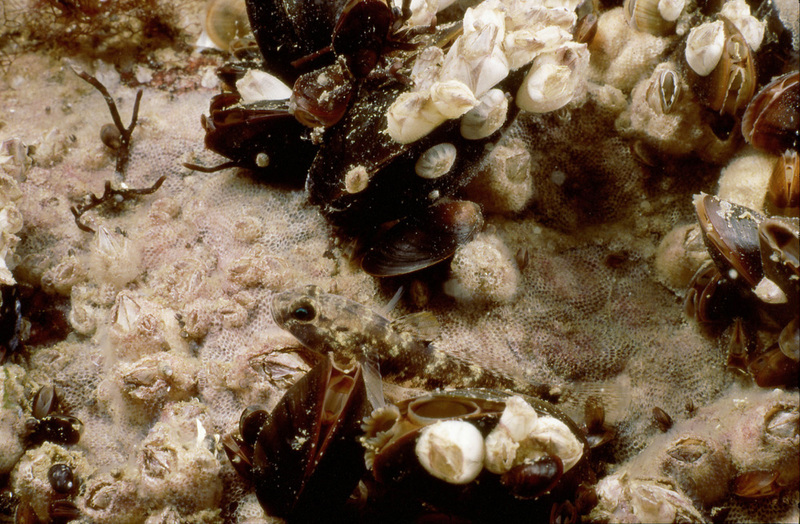 It doesn’t hurt if the male is able to tempt more than just one female into his nest. 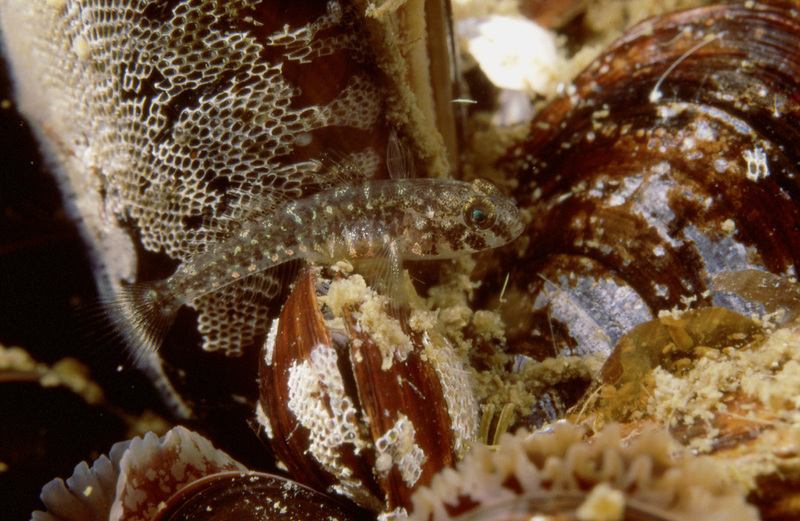 The sand goby also lives in areas where there are no sand gaper shells for nest building. 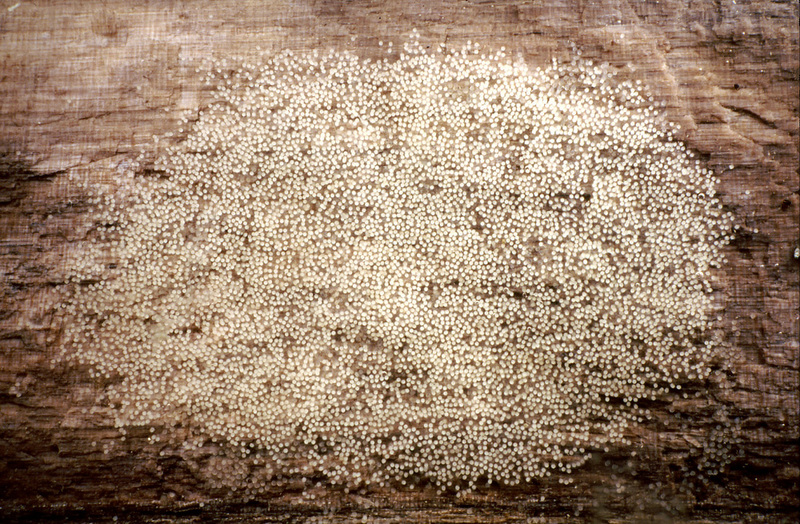 A piece of wood, like here, will also do as a substrate to lay the eggs on. 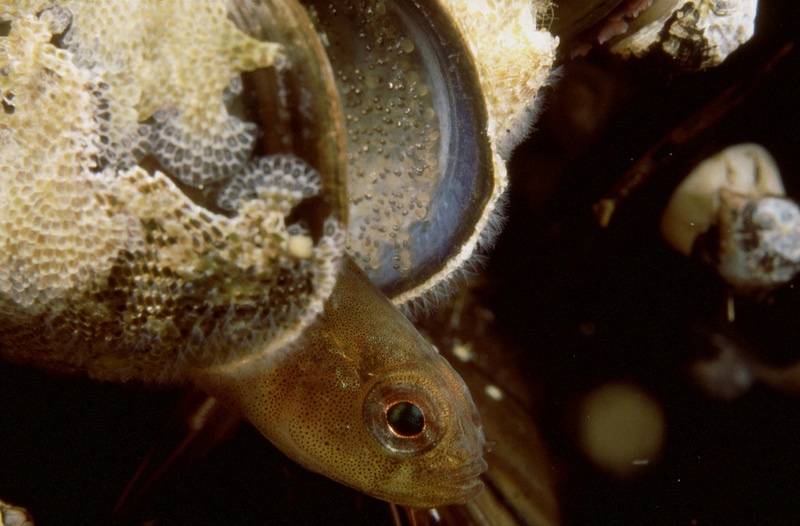 For the best reproduction success, though, the sand goby needs sand gaper shells, and, the bigger, the better. 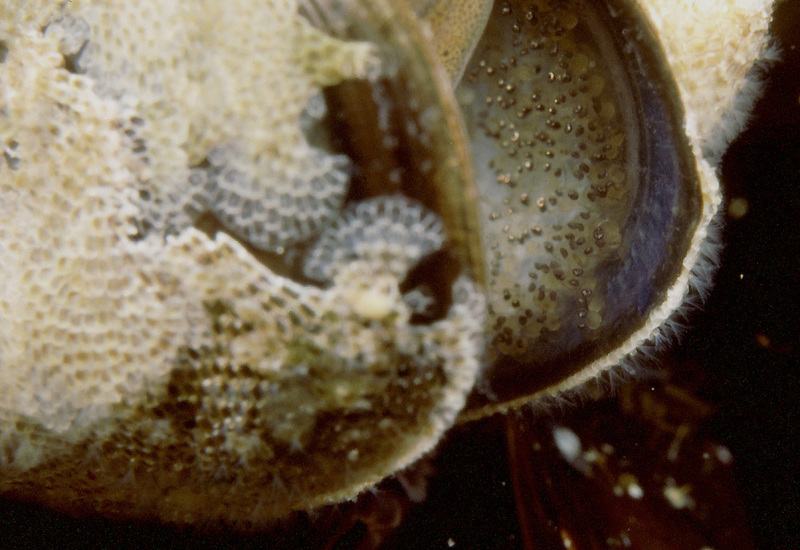 The biggest males tend to conquer the biggest shells and are the most capable to defend their offspring against intruders. 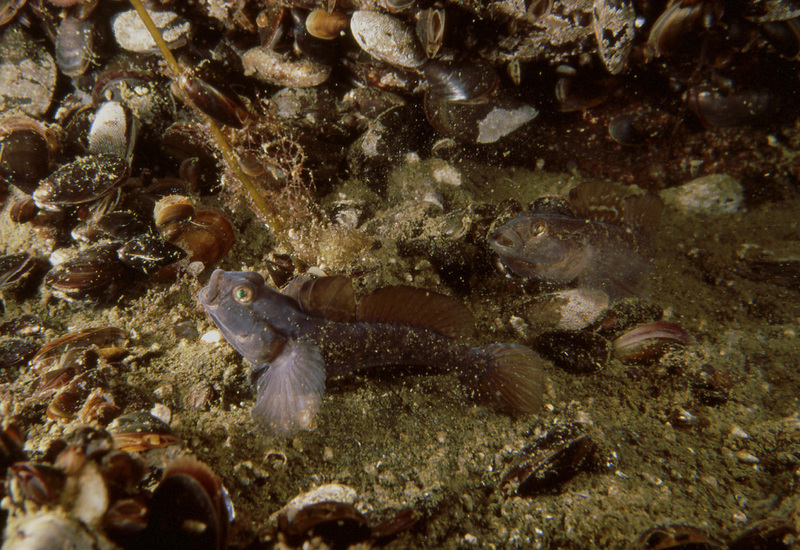 If there is a photographic legacy I’d like to pass on, perhaps it’s this: go and take this photo of the two-spotted goby males demonstrating for the right to spawn with the female, and do it with the camera at the right shooting distance. 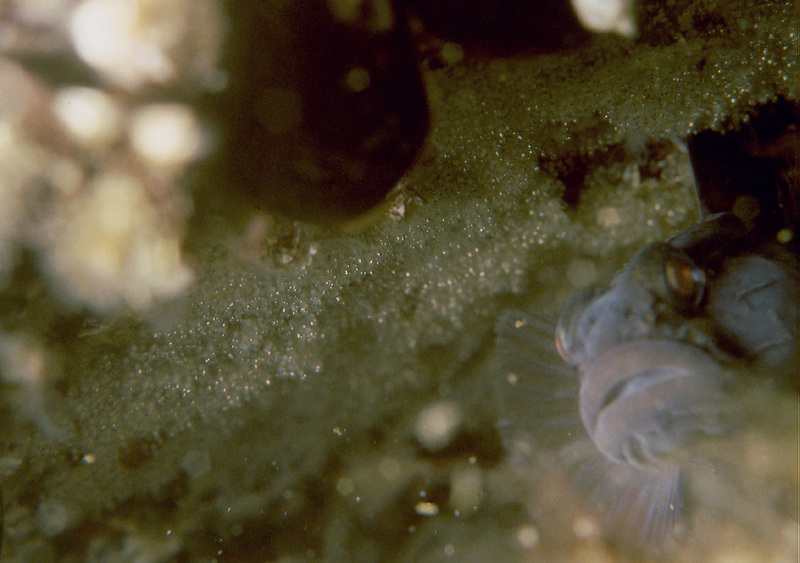 For me the situation was over too quickly to have time to bring the camera close enough. 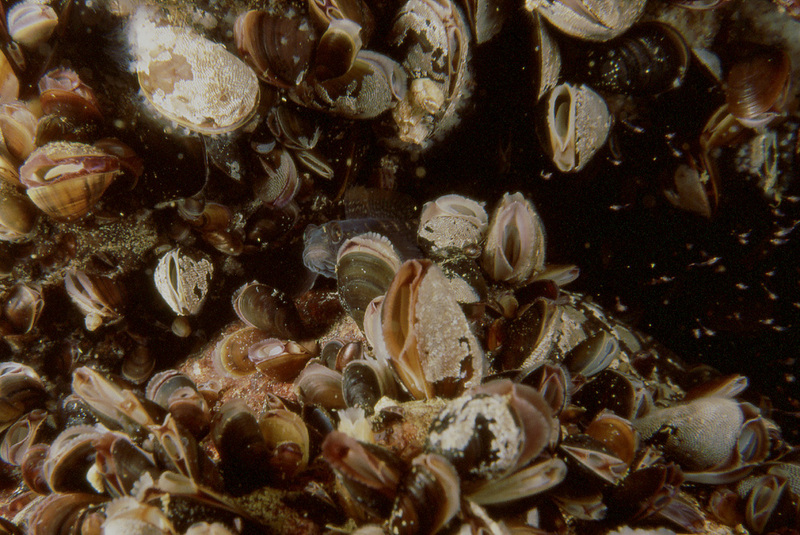 My observation is that when the spawning time is at hand the females gather in a group and hang around in areas where the males have enough empty mussel shells to build their nests of. 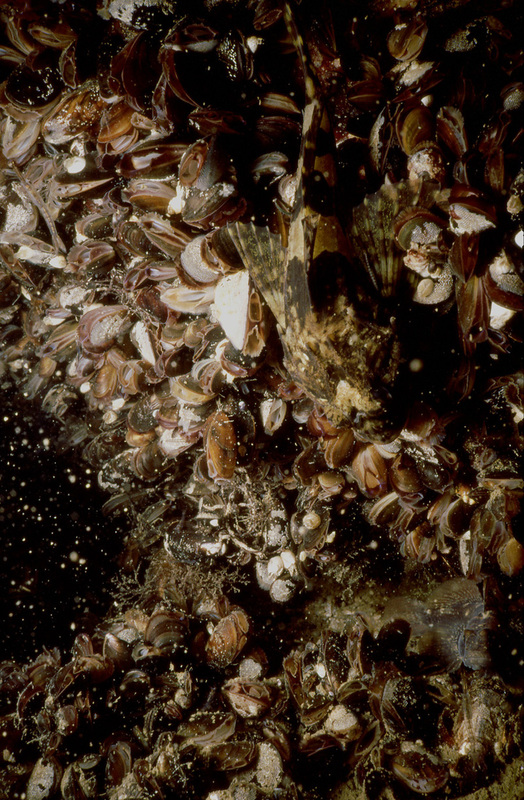 When the nest is ready and the female has visited it, the male keeps hanging around, and rests on the bottom nearby, swims around or aerates the eggs in the nest. 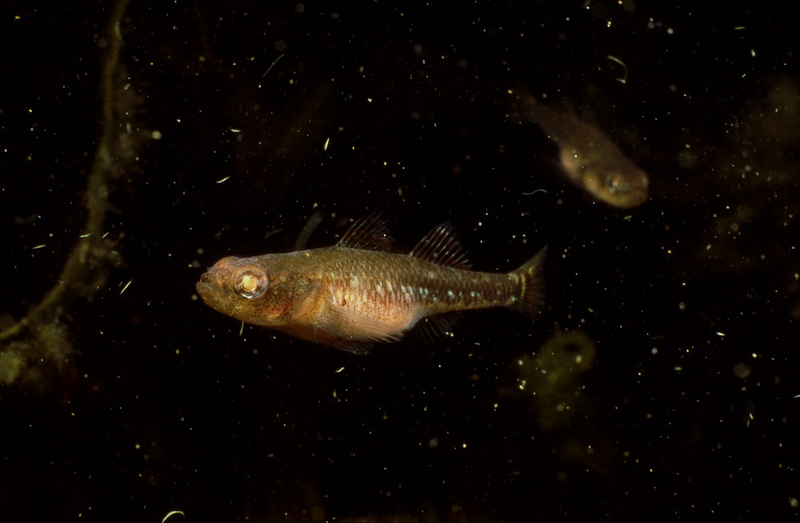 Juvenile black gobies are not as dependent on their hiding holes as the adults are. 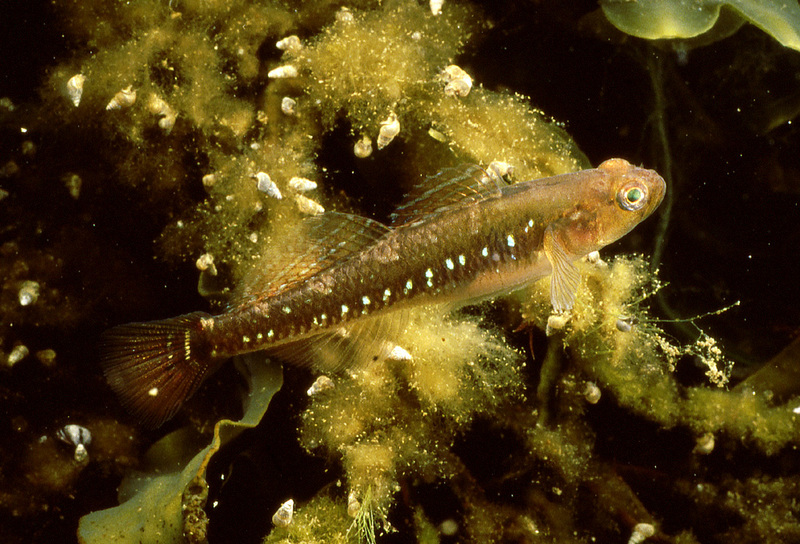 They tend to live in parts of the littoral zone where adult gobies are rarely seen. 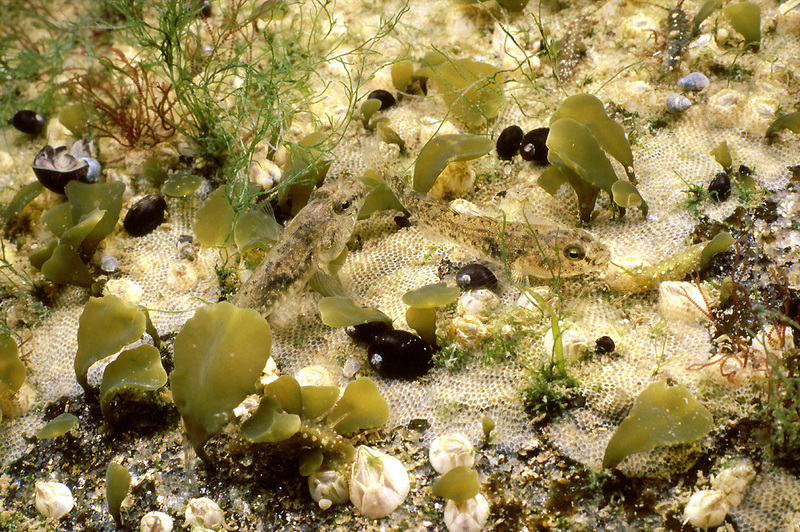 Typically, the juveniles move around in the shallower part of a rock cliff, in the little crevices formed by the sessile animals and even among the filamentous algae. 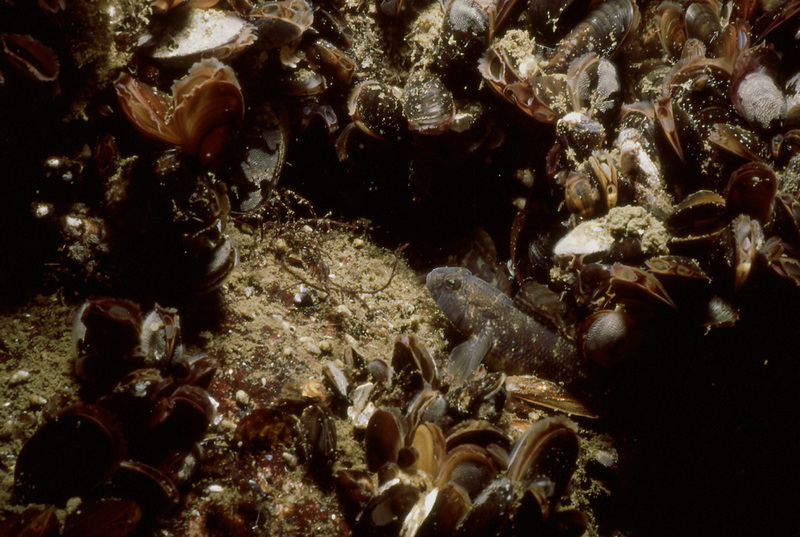 The urge of the typical black goby behavior is there from an early age on: this fish approaching adulthood took shelter in a mussel shell in the middle of a large area of sandy bottom. 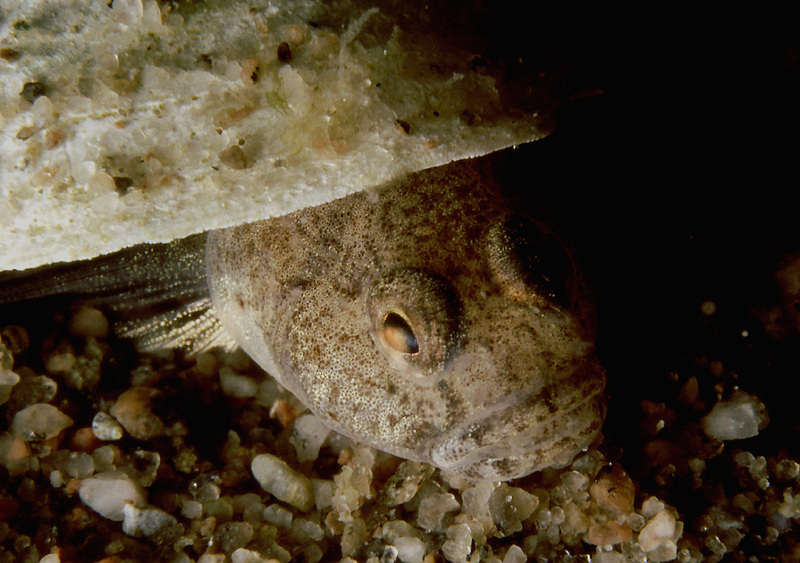 At a later age the hiding behavior is all the more clear with even territorial tendencies. 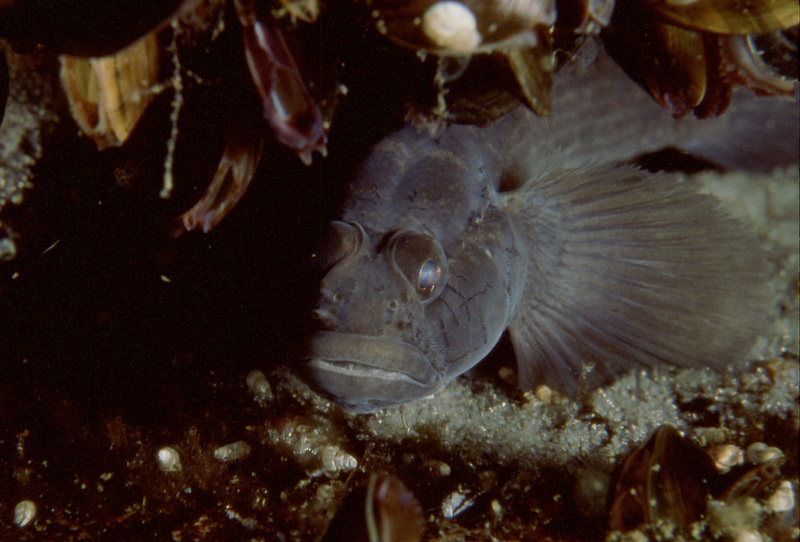 The black goby will hide in any hole available when feeling threatened but when the spawning period approaches, there is another reason for being interested in the holes: the fish lays her eggs preferably in protected openings of a rock cliff. 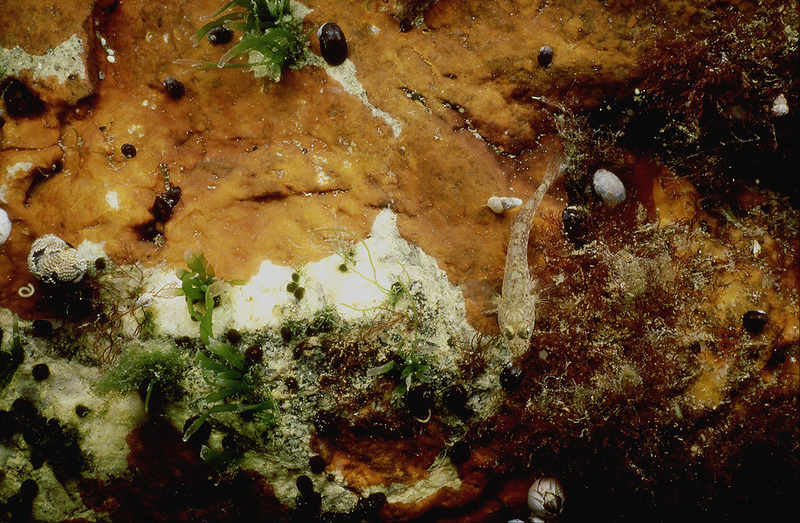 It’s the duty of the male to conquer a suitable spot and protect the eggs. 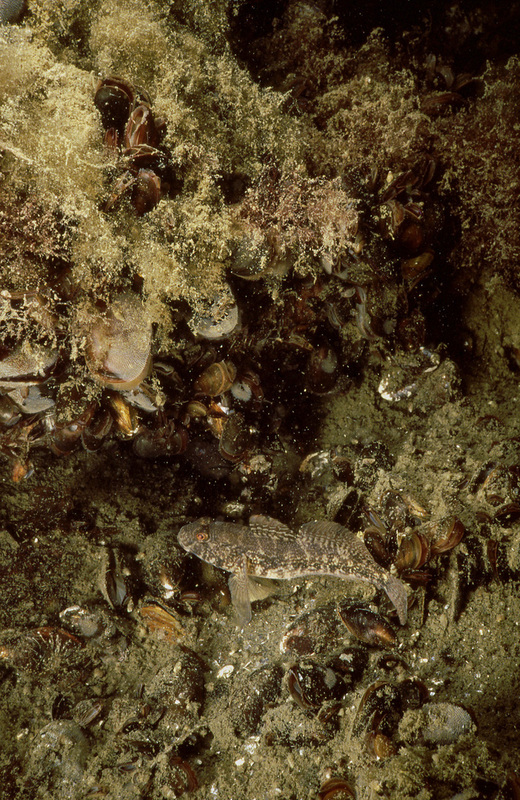 Crevices and holes are the favorite spawning site but even a completely open surface of rock will do, if the better places have been taken already. 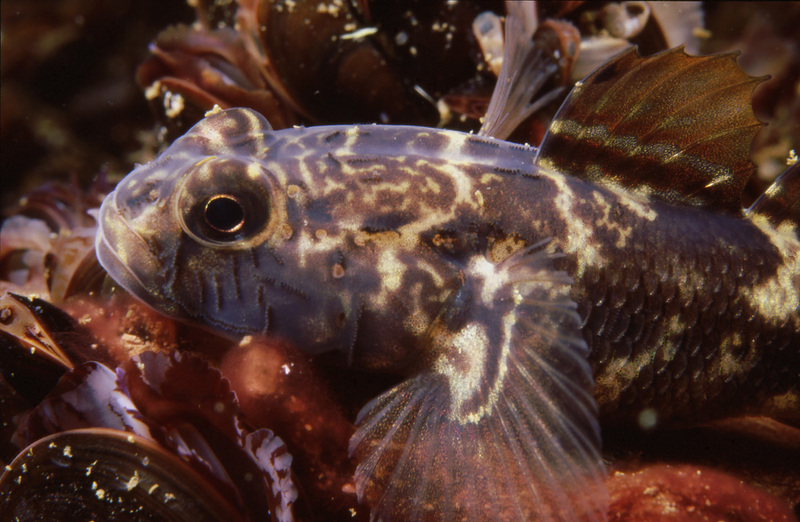 The round goby will soon be the biggest of the local gobies, no doubt, and will dominate the area it pleases but it will hardly be prettier than the black.